The global airport kiosk market is by nature moderately fragmented owing to the occupancy of limited number of players situated at various parts of the world, as reported by Transparency Market Research in its new report. Over the past couple of years, installations of the airport kiosk have significantly spurred in order to offer air passengers with more flexibility and convenience. Companies concentrating on new product development and innovations, meanwhile capitalizing on the mounting demand, are expected to have good future growth prospects in the airport kiosk market. Key players tracked by the report that underpin the market expansion significantly include Fujitsu Limited, Embross Group, Diebold Nixdorf AG, Toshiba Corporation, Rockwell Collins, Inc., NCR Corporation, Bolloré SA, and SITA SA. These market participants are adhering to aggressive marketing strategies in a bid to acquire a competitive edge. They are increasingly focusing on technological innovations and developing high-tech facilities including automated passbook kiosks, and visa through kiosks for implementation across busy airports. Airlines are increasingly focusing on adopting self-service solutions, that offer convenience to passengers and airport kiosks have gained paramount importance on account of this. Installation of airport kiosks has considerably helped passengers to avoid standing in long queues and delays at airports. The airport kiosks enable airport authorities in meticulously managing soaring airline passenger traffic, as they are equipped with in-built high-tech features, and offer effective solutions for expediting and controlling check-in, the passenger clearance, and the baggage clearance. Proliferation in IT spending across airports will also support adoption of airport kiosks. With the advent of privatization, several companies have been encouraged to revamp airport facilities with modern infrastructure. In addition, airlines are making huge investments in personalizing the passengers’ journey, subsequently augmenting demand for advanced facilities such as airport kiosks. Introduction of innovative mobile technologies has offered passengers with services similar to those of airport kiosks. Mobile technologies compatible with smartphones and tablets deliver tasks that are performed by airport kiosks, comparatively at an inexpensive cost, which in turn prevails as a factor hindering adoption of airport kiosks to a certain extent. 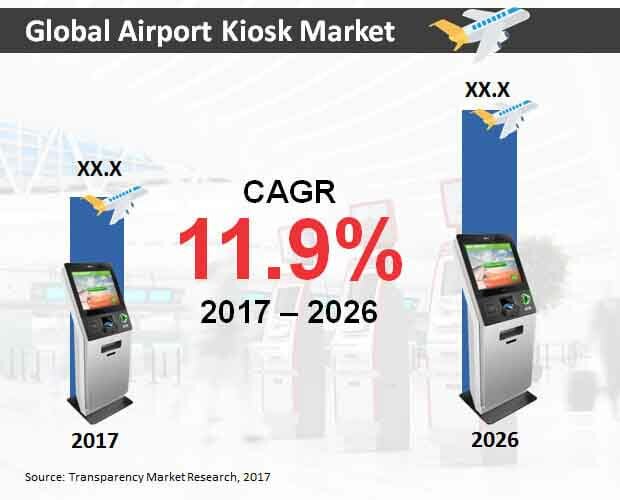 According to Transparency Market Research, the global airport kiosks market will register a CAGR of over 10% in terms of value throughout the forecast period, 2017 to 2026. Global sales of airport kiosks are estimated to exceed 100,000 Mn units by 2026-end. The report projects baggage check-in and information kiosks to remain dominant among types of airport kiosks, in terms of volume sales. This is mainly because airports are increasingly making investments in installation of advanced baggage check-in kiosks and information kiosks, so as to facilitate optimization of common operations at the airports. These kiosks further complement flexibility and comfort of passengers. In addition, sales of automated passport control kiosks and internet kiosks are slated to exhibit the highest CAGR in terms of volume through 2026. In terms of volume, Europe will continue to lead the global airport kiosks market, trailed by North America and Asia-Pacific excluding Japan (APEJ). Among these regions, APEJ will continue to reflect the fastest expansion in volume sales of airport kiosks through 2026. Latin America will also witness high volume sales of airport kiosks to reach nearly 12,000 Mn units by 2026-end.